Topaz is found in many colors such as blue, pink, brown, green, and colorless, but yellow is the color most often associated with this gem. All yellow stones were once called topaz but today the real orange-red “imperial” variety is a rare find. According to Pliny, the name topaz was derived from the Island of Topazos in the Red Sea, which probably refers to Zeberged, ancient source for peridot. But it is more likely that the name derives from the Sanskrit word «tapas» meaning fire. The Egyptians believed that topaz was colored with the golden glow of the sun god Ra. The ancient Greeks believed that it had the power to increase one’s strength and make its wearer invisible in cases of emergency. The Romans associated topaz with Jupiter, who is also the god of the sun. In the 19th century, pink topaz was discovered in Russia. The gemstone was so coveted that only the Czar, his family, and those he gave it to were allowed ownership. When worn as amulet, topaz was said to drive away sadness and strengthen the intellect. Mounted in gold and hung around the neck, it was believed to dispel bad charms. Reduced to powder and put in wine, topaz was a cure for insomnia, asthma, burns and hemorrhage. Topaz was also said to change its color in the presence of poisoned food or drink. All these mystical powers were believed to increase and decrease with the phases of the moon. One of the most famous topaz gems is a giant specimen set in the Portuguese Crown. Another beautiful topaz is kept in the Green Vault in Dresden. The Smithsonian Institution, American Museum of Natural History in New York, and the British Museum display also numerous outstanding rough or cut stones. The natural blue crystals found in Texas and in the Ural Mountains of Russia are not mined in enough quantities to meet the demand for inexpensive transparent blue gems. White or light blue topaz is commonly irradiated and heat treated to become blue. These stones are stable in natural light but not under the jeweler’s torch, where its color reverses to white. Natural brownish-yellow stones are heated to become pink. 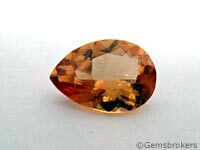 Brown or « champagne » topaz, even though it is a natural stone, looses its color when exposed to sunlight or strong electrical lighting. «Brazilian sapphire» and «the slave’s diamond» are ancient names used for topaz and are no longer in use, but «Bohemian topaz», «Madeira topaz», «Golden topaz», «Occidental topaz», «Spanish topaz», «Indian topaz» are names forbidden today, but still in use. 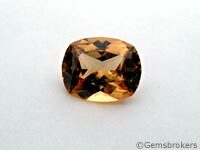 These latter names describe citrine, the much less expensive alternative to topaz.